Warm Up Nov. 30 Science Write your homework in your agenda. 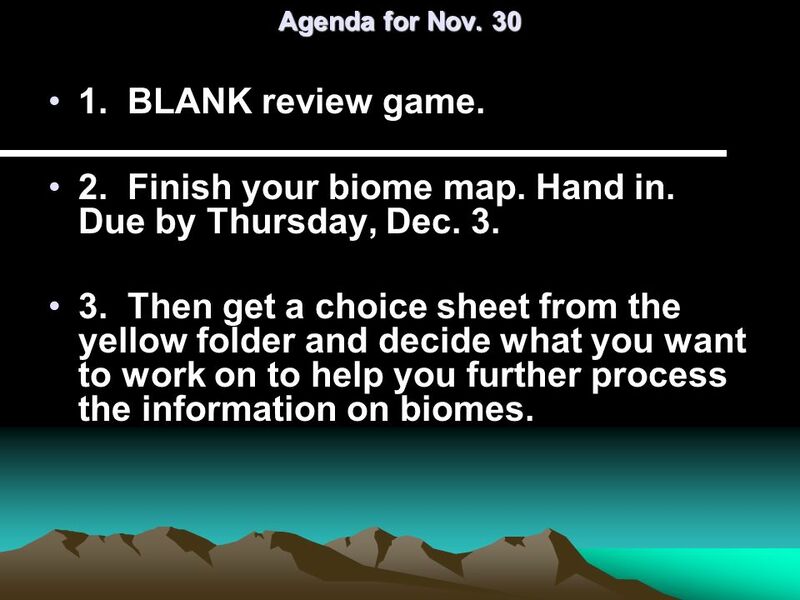 ****Write this in agenda: Biome quiz is Tues. Dec. 1 (TOMORROW ) and TEST is Thurs. Dec. 3. 1 Warm Up Nov. 30 Science Write your homework in your agenda. ****Write this in agenda: Biome quiz is Tues. Dec. 1 (TOMORROW ) and TEST is Thurs. Dec. 3. You have your dark blue study guide!!!! Get a review sheet out of the green folder and complete it. The word bank on the back is for Examples and Characteristics. If you finish before time is called, study your study guide. 4 Agenda for Nov. 30 1. BLANK review game. 2. Finish your biome map. Hand in. Due by Thursday, Dec. 3. 3. Then get a choice sheet from the yellow folder and decide what you want to work on to help you further process the information on biomes. 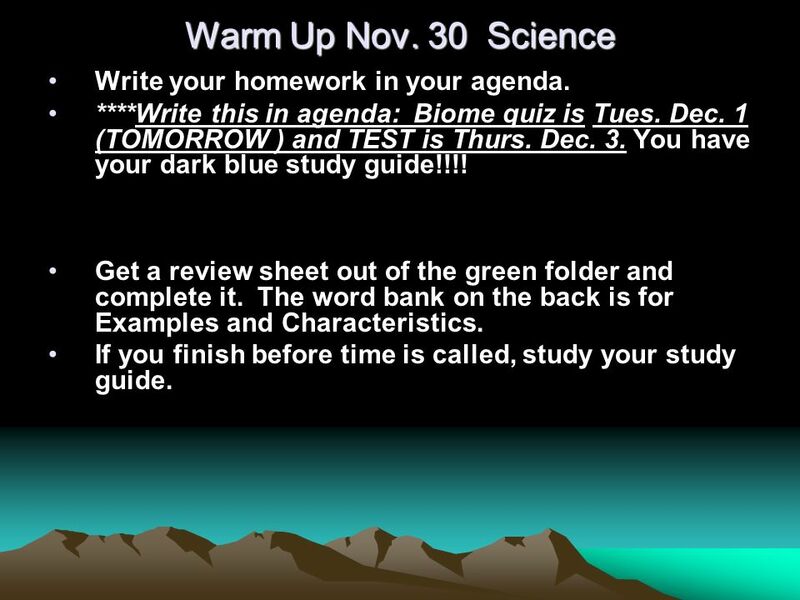 Download ppt "Warm Up Nov. 30 Science Write your homework in your agenda. ****Write this in agenda: Biome quiz is Tues. Dec. 1 (TOMORROW ) and TEST is Thurs. Dec. 3." Marine Habitats and Communities. 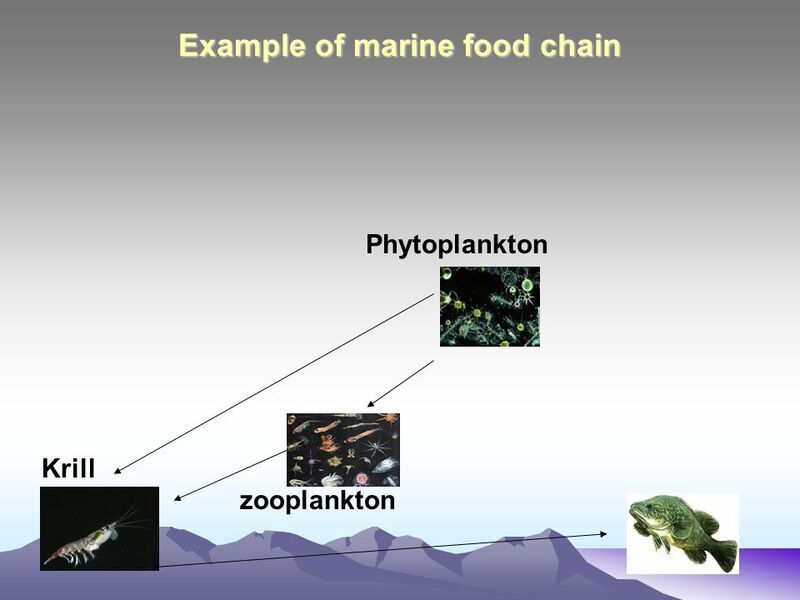 Main Concepts – Marine Habitats  Physical environment where community of organisms live is called a habitat.  Combination. Intertidal Zone The intertidal zone is a very harsh environment. The organisms that live here have adaptions that allow them to live both submerged with. How many people visited a beach this summer? How much of the earth’s surface is covered with oceans? 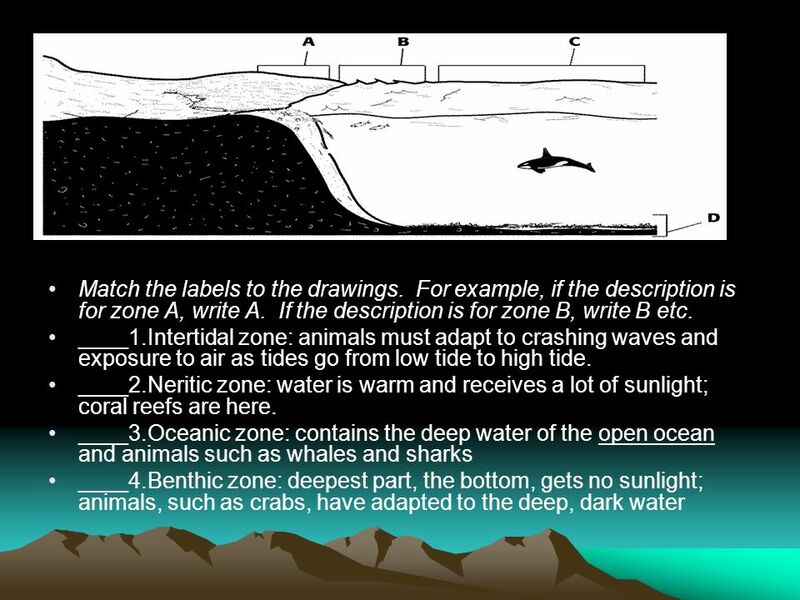 OCEAN ZONES Chapter 13 Section 2 Ocean Zones Chapter 13 Section 3. The Ocean biome is the worlds largest biome. Life in the ocean is very diverse. The smallest ocean creature is so tiny that it can only be seen under. Warm-Up Update your Table of Contents Write your homework – leave it out to be stamped Get vocab cards out to be checked Put your Titanic Article in the. Aquatic Biomes Characterized by depth, temperature, and chemicals (salt and oxygen) dissolved in the water Two types: Freshwater and Marine. Unit 2.5: Marine Life. Bell Work Nov 6 Agenda: 1.Planner: Choose your animal for the Oceans Animal Project by Nov 10 2.Bell Work 3.Good Things 4.Notes. Aquatic Biomes Freshwater Biome: rivers, streams, and lakes. - No salt. Do Now What covers almost three-fourths of Earth’s surface? What holds both the largest animals and some of the smallest organisms on Earth? Talk with.  World’s oceans cover 71% of the Earth’s surface OCEANS.